Splashing out at the pool party. Our vacation is coming to an abrupt end but, with one weekend left, we still have another Saturday night pool party to dive into and splash around. We have been staying at the Phuket Gay Homestay in Neramit Hill, just a short tuk-tuk ride from Patong Beach in tropical southern Thailand. This unique and welcoming five bedroom residence is the perfect place to unwind for a few days, or weeks. It is situated in a quaint and friendly local village and a stay here is a taste of real Thai hospitality. The house, built around a stunning pool, provides a welcome retreat from the madness of downtown Patong. At around 5pm every Saturday afternoon the splashing and games begin. This weekly pool party is for ‘men only’ and the best attended gay event in the area. Guys visiting from all over the world, and a loyal following of Thai and expat locals, makes this a perfect precursor to the start of the new week. 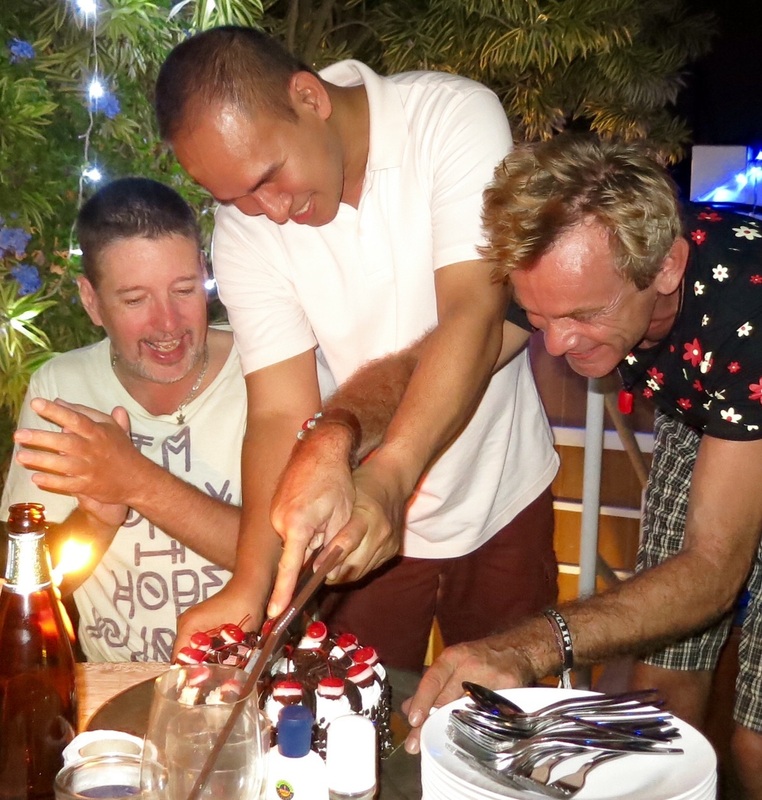 Homestay owners and hosts Ulf and Boy ensure that the house and club music is pumping, the alcohol free flowing and the BBQ hot and ready for action. Ulf’s succulent marinated spare ribs and a selection of homemade curries and pastas have been all day in the preparation and are served at around 7pm or, Thai time, in reality 8pm. At 200THB ($8 AUD) per person, this party is superb value for money. There is also a small bar with soft drinks, beer and sprits which can be purchased at very reasonable prices. Don’t be afraid to come without a buddy, you will soon meet other guys, either in the pool for a quick game of volleyball, sharing a cocktail and travel tales poolside or simply chilling under the stars in the balmy night air. One guy we met who was visiting from Sweden said to us, “I love the open and fun atmosphere of this party”. Perhaps welcome relief from a punishing north European winter. As the evening progresses some of the regular party revellers have a reputation for putting on a show. Whether emulating Bangkok go-go boys or catwalk modelling around the pool in the Homestay’s signature pair of black and silver platform heels, some of these guys seem to have missed their calling. A birthday makes the party even more special and this is the perfect place for a celebration. 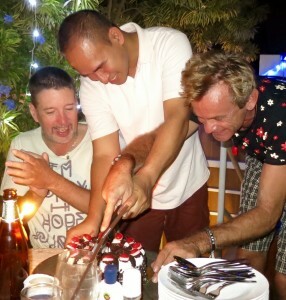 One thing is for certain, the pool party is an excellent opportunity for gay men travelling in the Patong area to meet-up and have a great time. All you need to bring is your swimmers and as the party and the night warm up, you might not even need them. After the party finishes around 10pm, many of the party guests return to the Paradise Complex in Patong to enjoy the rest of the evening in places like Sundowners, MyWay or Zag Bar. Watch as the bars compete for the crowd’s attention with duelling drag shows and hot, oiled muscle boys. For a late night finish you might want to move inside for the shows at Zag Bar or further down the street at the legendary Boat Bar where you can finish the night with some dancing, ‘glamming’ and glancing. When you wake up the next day and decide it’s time for recovery take yourself down to Patong’s gay beach, not far from Soi Bangla (look for the rainbow flag in front of La Flora Hotel). Look for the rainbow flag on Phuket Beach. Although our time at the Homestay has come to an end, Facebook and Twitter have never been so busy. The party’s never over!